Outdoor rooms are quickly growing in popularity as more and more Minnesotans are looking for ways to enjoy the great outdoors close to home. And what could be closer than your own back yard? Having outdoor eating and gathering spots gives you versatility for cooking and other types of entertaining, especially in the summer. Moving the cooking out of the house on a warm day can be a real treat, both for the cook and the guests! Outdoor rooms are also great spots to relax, reflect, enjoy a quiet time to read and have a cup of coffee, or simply just sit back and watch the wildlife. Whatever the purpose of your outdoor areas, finish them off with the right kind of furniture. The furniture you choose should be appropriate for the purpose of the area and should blend well with the overall feel of your landscape design as well as the architecture of your home. 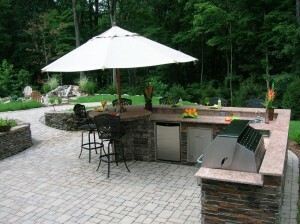 For instance, note how the outdoor kitchen here has the feel of a European sidewalk bistro. The market umbrella and the pierced wrought-iron-look stools nestled around the peninsula and the bar above the prep area are the perfect place for guests to gather and chat with the cooks, much as you might visit with a street vendor while you’re waiting for your treat to be dished up. The relaxing patio in the distance on the left has quite a different flavor. Tucked up against the woods, Adirondack lounging chairs are the perfect complement to the trees and waving grasses surrounding this spot. Comfort: This should be your first criteria. Your outdoor rooms are to be enjoyed, but if the furniture isn’t comfortable, it won’t work. And take into account more than how it feels when you first sit down. Can you imagine sitting or lounging in that chair for an hour? If not, look for another option. And when choosing chairs and stools for eating areas, make sure that the chair arms don’t interfere with arm movements from eating, such as using a steak knife. Durability: Your furniture is meant to be used outdoors, so it needs to stand up to the elements. Keep in mind where it will be placed. Deck furniture that’s sheltered by an overhang may not need as much moisture and fade resistance as chairs placed in full sun in the open. And if you’re choosing wicker or rattan, make sure it’s treated to stand up to the weather. Protection: Some outdoor furniture comes with protective covers; for others you’ll need to buy specially-made protection. Factor the cost of that in mind when you’re price comparing as well. Weight: Unless you’re putting in custom stone or masonry furniture that’s intended to stay in place once installed, you should plan on your furniture getting moved around frequently. If it’s too heavy for one person to easily move, it’s probably too heavy. At times a severe storm may come up and you won’t always have another hand to quickly get it under cover or into the garage. Versatility: People tend to change the decor of their outdoor rooms frequently, so as you’re choosing colors and upholstery patterns, keep toward the neutrals. You can always accent with brightly colored pillows or other accessories, but those neon-green that look just great with this year’s color scheme won’t do in a few years if your taste changes to something more muted. If you’re looking for something truly unique in terms of outdoor furniture and you’re not finding it in the stores, we have a suggestion for you. To complement our landscape design plans, many of which include native Minnesota stone, we’ve recently added custom stone furniture to our landscape services. Handcrafted of local stone, each piece is designed in conjunction with the client. You’ll get outdoor furniture that will be naturally beautiful as well as a conversation starter!